A computer image shows a bacterial cell invaded by a virus. The virus uses the cell to copy itself many times. It has built a protein compartment (red, rough circle surrounding the center) to house its DNA. 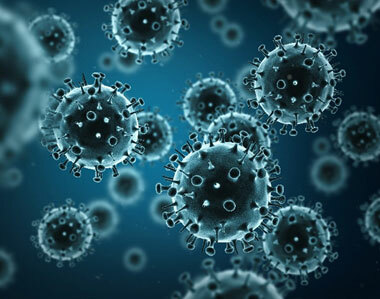 Viral heads (blue, smaller pentagonal shapes spread through out) and tails (pink, rod shaped near the edges) are essential parts of a finished viral particle. The small, light blue particles are the bacterium’s own protein-making ribosomes. Credit: Vorrapon Chaikeeratisak, Kanika Khanna, Axel Brilot and Katrina Nguyen. As inventors and factory owners learned during the Industrial Revolution, the best way to manufacture a lot of products is with an assembly line that follows a set of precisely organized steps employing many copies of identical and interchangeable parts. Some viruses are among life’s original mass producers: They use sophisticated organization principles to turn bacterial cells into virus particle factories. Scientists at the University of California, San Diego, and the University of California, San Francisco, used cutting-edge techniques to watch a bacteria-infecting virus (bacteriophage) set up its particle-making factory inside a host cell. 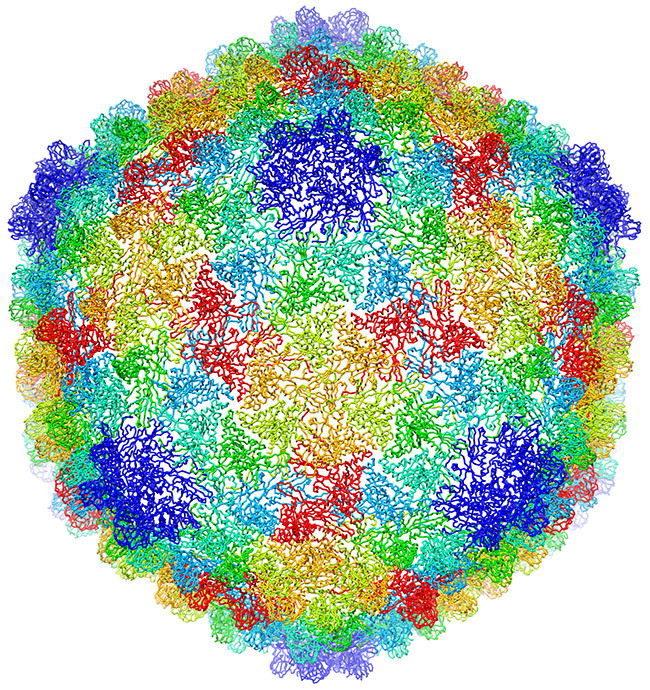 An atomic-scale model of a virus that infects the Salmonella bacterium. Credit: C. Hryc and the Chiu Lab, Baylor College of Medicine. This sphere could be a prototype design for the 2018 World Cup official match soccer ball, but you won’t see it dribbled around any soccer fields. The image is actually an atomic-scale model of a virus that infects the Salmonella bacterium. Like a soccer ball, both are approximately spherical shapes created by a combination of hexagonal (six-sided) and pentagonal (five-sided) units. Wah Chiu, a biochemist at Baylor College of Medicine, and his colleagues used new computational methods to construct the model from more than 20,000 cryo-electron microscopy (cryo-EM) images. Cryo-EM is a sophisticated technique that uses electron beams for visualizing frozen samples of proteins and other biological specimens. 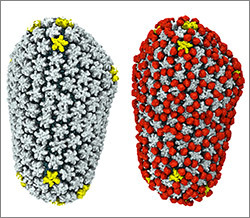 The researchers’ model, published in a recent issue of PNAS, shows the virus’ protein shell, or capsid, that encloses the virus’ genetic material. Each color shows capsid proteins having the same interactions with their neighbors. 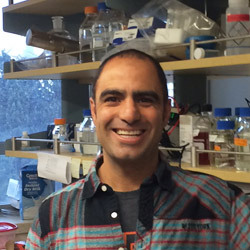 The fine resolution allowed researchers to identify the protein interactions essential to building a stable shell. 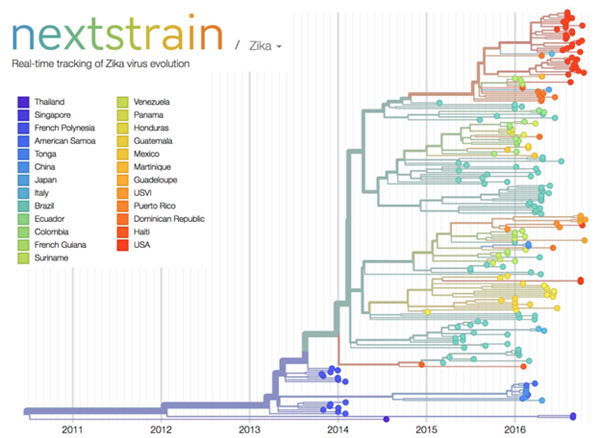 They developed a new approach to checking the accuracy and reliability of the virus model and reporting what parts are the most certain. The approach could be used to evaluate other complex biological structures, potentially leading to better quality models and new avenues for drug design and development. This research is funded in part by NIH under grants R01GM079429, P01GM063210, P41GM103832, PN2EY016525, T15LM007093. Scientific discoveries are often stories of adventure. This is the realization that set Blake Wiedenheft on a path toward one of the hottest areas in biology.